'The Heart of the Black Hills' Localizado a apenas 20 milhas de Deadwood, Mt. Rushmore e Rapid City. No Deer Meadow você pode 4 rodas, caminhada ou esqui cross country direita da porta da frente. Snowmobile trilhas com em 10 milhas do lodge. Pack seu tackle / pólos porque o seu próximo a alguns dos melhores pesca de fluxo ou lago de pesca. Atrações: Aqui em Deer Meadow Lodge você está no "coração do Black Hills '. Os seus 20 milhas para Deadwood para o jogo. Suas menos de 20 milhas para alugar snowmobiles, 4 rodas e bicicletas para a trilha Mickeson. É apenas 20 milhas a Rapid City para fazer compras, campos de golfe, mantimentos, e etc. Mount Rushmore / Crazy Horse é apenas 25-30 milhas. Várias cavernas nas colinas a turnê. Menos de 6 milhas para Chuck Wagon jantar / show. Lake Pactola é apenas 8 milhas de distância, que oferece pesca, aluguel de barcos e esqui aquático. Galeria de Jon Crane em Hill City é de 20 milhas. Rochford é de 10 milhas "Moonshine Gulch Saloon / pequeno da América '. Spearfish Canyon é de 30 milhas. Você tem a estrada agulhas, Custe parque estadual, Sturgis Rally 2010 70º aniversário, Keystone, e muitas outras atrações que estão perto de Deer Meadow Lodge. Faça memórias duradouras em Deer Meadow Lodge lodge. Seu grande para o Rally Sturgis, reuniões, encontros familiares, férias, ou apenas para fuga lugar. Ligue hoje para reservar a sua próxima experiência de mudança de vida. Caça: O Lodge é perfeito para Deer, Turquia e Elk Hunters. Ele dorme até 8 para as suas necessidades de caça. Localização perfeita para todas as necessidades de caça! Temos veados, perus e de alce na nossa área imediata! Candidate-se a sua licença e livro Deer Meadow Lodge para as suas próximas excursões de caça! Pesca: Lago Pactola é cerca de 8 milhas com aluguel de barcos. Sheridan Lake é cerca de 15 milhas. Deerfield Lake é de 20 milhas. Todos eles têm grande pesca. Pesca do córrego é de apenas 6 milhas do lodge. Mestre completa com duas pias, chuveiro principal 3/4 com 2 pias e lavadora / secadora .. Toalhas de banho são todos algodão e fornecidos para seu uso! Nós oferecemos telefone gratuito e Internet wireless. Temos um hotub para Sook suas atividades diárias de distância. A lareira interior real para que você possa desfrutar os cheiros das colinas blak! Camas confortáveis ​​com lençóis de algodão fio de alta e travesseiros de plumas! Great place to get together with friends for a long weekend and make a lot of awesome memories that will last a lifetime. Clean, beautiful, relaxing. Truly a dream come true! Deer Meadow Lodge has met and exceeded our expectations time and time again. The owner is so nice and very helpful. He goes out of his way to make sure your stay will be wonderful. The property and cabin are both perfect. We cannot say enough good about it! And the location is wonderful as well. Centrally located and a 20-30 minute drive from rapid city, hill city, Mount Rushmore, and deadwood. This was not our first stay and definitely won’t be our last! Trust me, this is your home away from home that you’ve been looking for! We had a great time staying here during a recent trip to the hills. Clean and easy to find. Perfect place to stay for our snow mobiling trip! 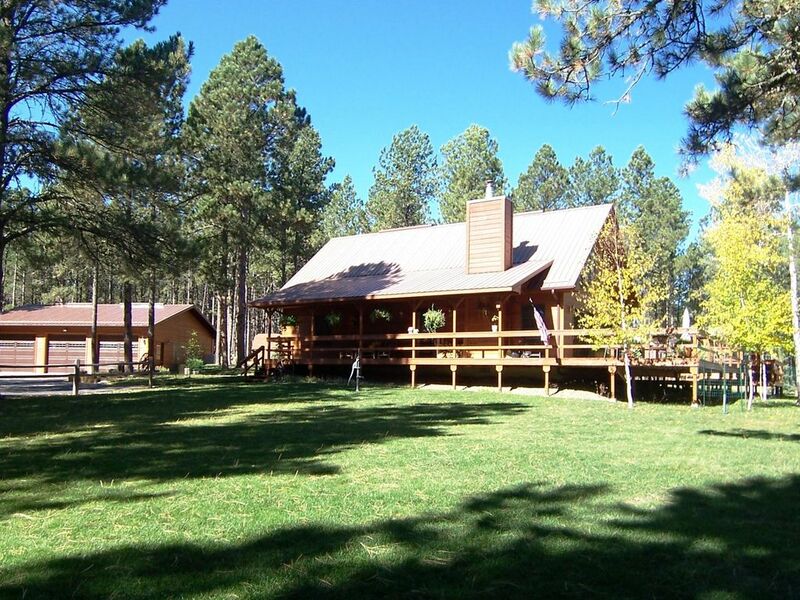 This lodge is well maintained and has everything you need. Just bring your food and clothes and you are set! Amazing decor at the lodge with spectacular views and the locals are very friendly! The cabin was in the perfect location for our weekend out in the hills, we enjoyed the hot tub and the fireplace. My Wife and I recently stayed at Deer Meadow Lodge. It's the nicest cabin we've ever stayed at in the Black Hills. The cabin comes with everything you need! We enjoyed the smell of the freshly cut wood burning in the fireplace, the hot tub with a view of the stars and the close proximity to everything in the Black Hills. This place is a MUST stay for you and your family. See you again soon Deer Meadow Lodge! Thanks Seth.. Hope you return..
Estamos localizados a 20 milhas ao sul de Deadwood / chumbo na Hwy 385, a oeste da área de Sugar Shack / Trout Haven ou seis milhas ao norte da junção 44 oeste de Rapid City. The Heart of the Hills! Aproveite a visita e pedir descontos re-reserva! Golf: Tomahawk Lake Country Club é 11 milhas ao norte na Hwy 385 em direção Deadwood / chumbo. É um campo de 18 buracos com alimentos e bar. Rapid City tem vários campos. Ski: Terry Peak fica a apenas 35 quilômetros do Lodge. Call for 2 night stay between bookings!! It is possible to stay 2 nights if it lands between bookings.. Low Season $250.00 a night if booked a 4 night stay. No Cleaning Fees unless left inadequate as to when you came minus normal cleaning like laundry, vacuuming, dusting, and etc. Rent 3 days or less will be charged a $100.00 cleaning fee. Rates subject to change without notice. Prices are different for holidays.